Nationality Set 1 (olive drab Americans) contents: 4 countersheets with 912 die-cut counters total. 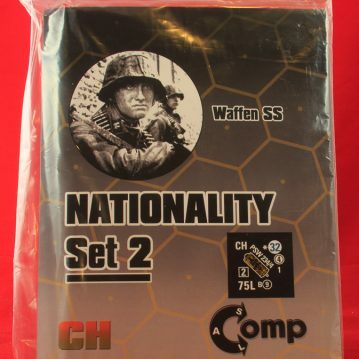 Nationality Set 2 (black Waffen SS) contents: 5 countersheets with 1,088 die-cut counters total. 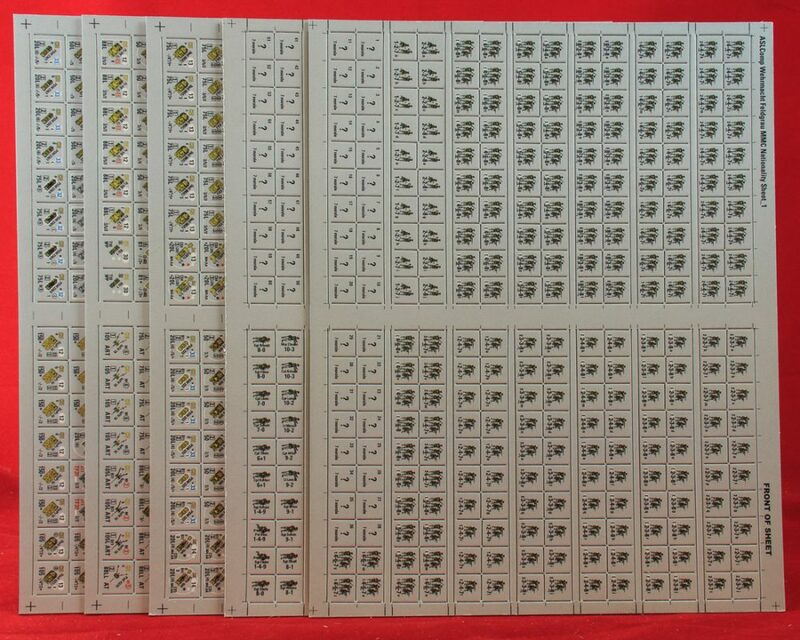 Nationality Set 3 ("feldgrau" [actually light gray] Germans) contents: 5 countersheets with 1,088 die-cut counters total. 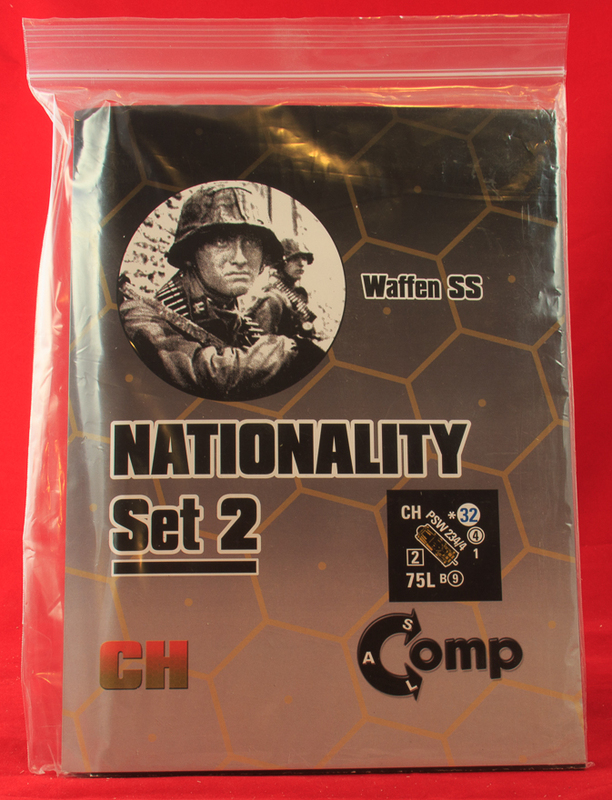 Nationality Set 4 (black "winter" Waffen SS) contents: 5 countersheets with 1,088 die-cut counters total. Nationality Set 5 ("feldgrau" [actually light gray] "winter" Germans) contents: 5 countersheets with 1,088 die-cut counters total. Nationality Set 6 ("early war" red Soviets) contents: 5 countersheets with 1,088 die-cut counters total. Nationality Set 7 ("summer 1942" red Soviets) contents: 5 countersheets with 1,088 die-cut counters total. 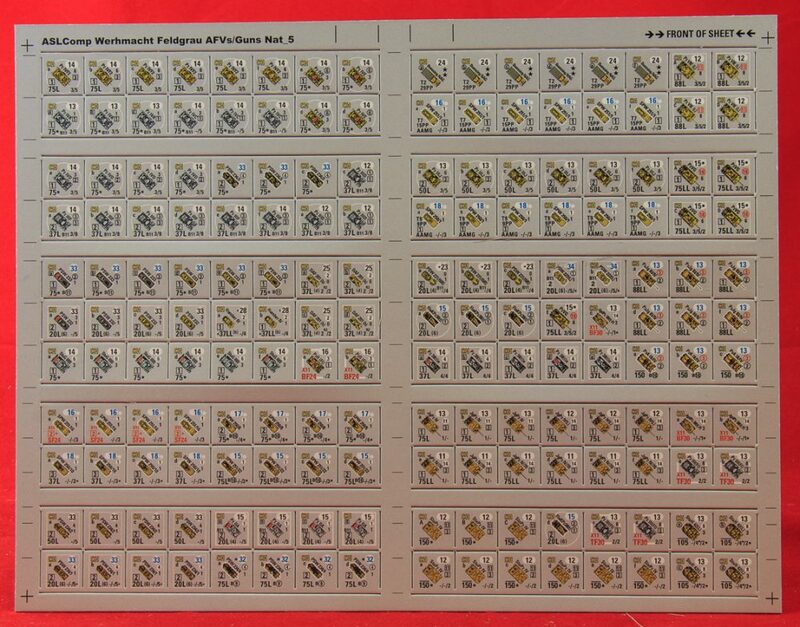 Nationality Set 8 ("mustard" Japanese army) contents: 5 countersheets with 1,088 die-cut counters total. Nationality Set 9 (1940 French) contents: ?? Nationality Set 10 (Soviet partisans) contents: ?? Although Critical Hit had already been selling its countersheets individually for several years, in 2017, Critical Hit started releasing a series of counterset-only products, largely centered on various nationalities or armed forces in World War II, often with variant colors. The reasons for Critical Hit to do this were largely three-fold: 1) they are products that require no playtesting or development, which are Critical Hit’s two weakest areas; 2) they are easy to produce and can be produced in virtually endless variations; and 3) there are many ASLers out there who simply have no self-control at all when it comes to buying products with counters. Put all this together and it appears that Critical Hit may have discovered a new little cash cow (especially as they charge an arm and a leg). On the bright side, it is actually better for Critical Hit to release products like these rather than scenario packs or HASLs that have not been playtested or developed. For now, Desperation Morale will include all of these nationality sets in one combined entry, because in many cases there may not be a lot to say about an individual set otherwise. If circumstances change, we will grudgingly break this up into multiple entries. Not all of the sets announced so far have been released; the others are here only as placeholders. The general physical quality of these countersets is fine; Critical Hit has finally learned how to do counters. The only problem is that the die-cutting on 5/8″ counters does not go far enough to the edges. There are, however, at least a few proofreading issues with some of the counters. Nationality Set 1: U.S. NS1 consists of 4 countersheets (2 with 5/8″ counters and 2 with 1/2″ counters) depicting the U.S. Order of Battle, with the counters rendered in an olive drab green instead of the brighter green color of official U.S. ASL counters. With an asking price of $59.95, that means $15 bucks per countersheet. The set (not seen by Desperation Morale) ostensibly contains a basic U.S. OB (i.e., no USMC, etc.). For comparison’s sake, MMP sells Yanks at $128, but Yanks comes with 6 countersheets, not to mention Chapter H, 8 geoboards and 41 scenarios. While this counterset appears serviceable, there is a reason why Avalon Hill & MMP did not choose olive drab as the U.S. color and that is because the color is, well, drab. Some purchasers have said that the olive drab counters are a bit hard to believe, which is believable, given their darker hue. Nationality Set 2: Waffen SS. Oh, how things change. Long ago, in a fabulous place called the 1990s, an infamous flamewar brewed up on the ASL Mailing List, at the time a key forum for ASL-related conversation, with Ray Tapio, the head of Critical Hit, severely criticizing Heat of Battle for announcing a product that would include black-colored SS counters (for those unaware of the controversy, many ASLers object to official or unofficial black SS counters because they glorify the infamous SS and because no other subnational armed force in ASL has its own counter color scheme other than the SS). At some point, however, Critical Hit discovered that black SS counters sold and reversed course. Now, years later, Critical Hit has probably produced more black SS ASL counters than any other publisher by a long shot and shows no hint of stopping. “We are in the business of listening to our customers,” Critical Hit announced in the marketing copy for this product. Apparently so. NS2 provides SS-loving ASLers with a complete Waffen SS rendered in black. The set consists of 5 countersheets (2 of 1/2″ counters and 3 of 5/8″ counters), depicting the SS (with a few red-colored berserk counters thrown in for good measure). Note that Critical Hit priced this product at $99.95, despite the fact that it has only one more countersheet than NS1, priced at $59.95. It seems Critical Hit knows its audience: there are some people willing to pay virtually any sum for black SS counters. According to Critical Hit’s marketing e-mails, NS2 allegedly contains a few “new” counters in addition to black versions of existing official ASL counters, including motorcycle and sidecar counters and a few new AFVs. 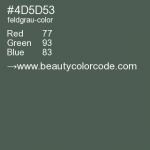 Note that this color bears no resemblance to the color of the counters that appear in NS3, which appears to be a light gray somewhat similar to the color of the Finns. Instead of feldgrau, Critical Hit simply gives users gray (although, ironically, some of the uniforms of the men depicted on some of the counters actually do seem to be feldgrau). Not only is gray a non-dynamic and relatively boring color for wargame counters, but ASL already has two too many sets of gray counters: the Finns (light gray) and the Italians (dark gray). It will be hard to use these counters in scenarios that also contain Finns and somewhat difficult to do so with Italians. In other words, Critical Hit made a poor choice here. The set consists of 5 countersheets (2 of 1/2″ counters and 3 of 5/8″ counters). The counters are standard German OB counters, plus a handful of red “berserk” counters. 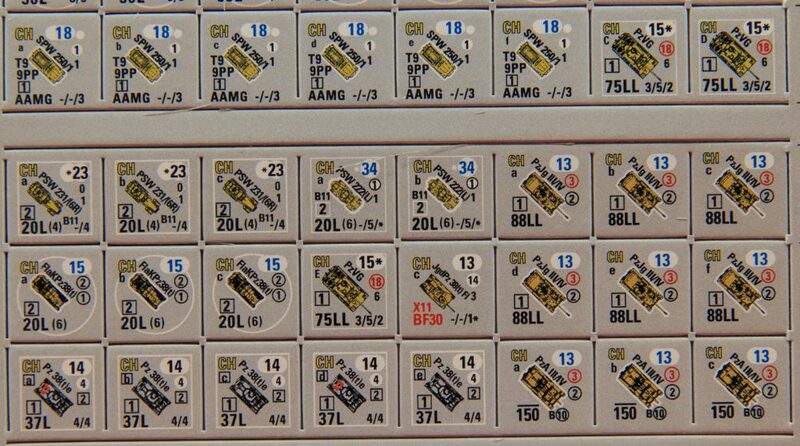 The AFV counters appear to have been converted from the Waffen SS counters of Nationality Set 2, because some of the counters mistakenly retain the blue movement values of the earlier set instead of the red values that they should have. Not Critical Hit’s best effort here and, since German counters are in easy supply, probably not one that will be too popular. 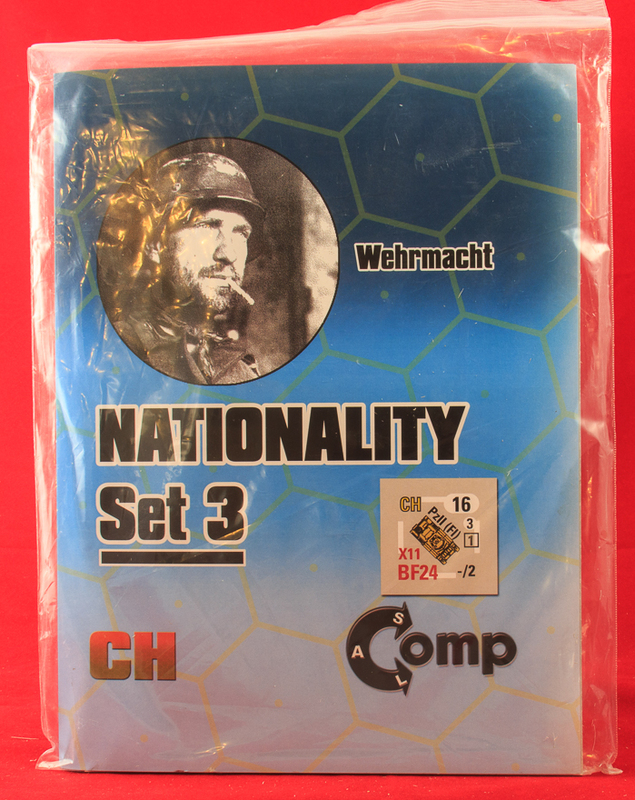 Nationality Set 4: Winter Waffen SS. This has apparently been released, though Desperation Morale has not seen it, nor seen it offered elsewhere. It consists of the same countersheets of Nationality Set 2, only the figure artwork is slightly different to make it look like winter clothing. Given that the counters are already white on black, any differences might be difficult to discern. Nationality Set 5: Winter Feldgrau with Greatcoasts. This has apparently been released, though Desperation Morale has not yet seen it, nor seen it offered elsewhere. It consists of the same countersheets as Nationality Set 3, only the figure artwork is slightly different to make it look like winter clothing. You’ve got to be a hoarder to want this. Nationality Set 6: Early War Russian REDS. 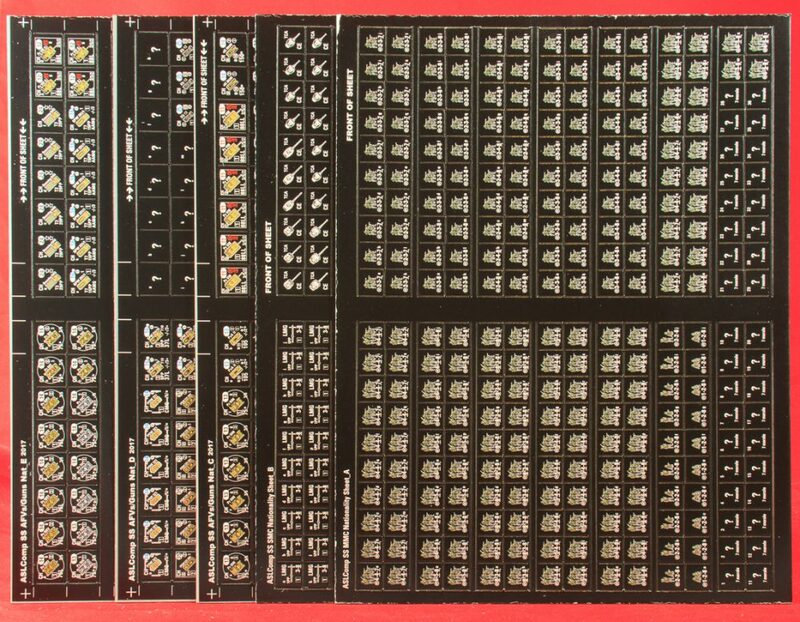 This counter set contains 5 countersheets (2 of 1/2″ counters; 3 of 5/8″ counters) depicting the Soviet OB in an alternative dark red color scheme. Nationality Set 7: Summer 1942 Russian REDS. This counter set contains 5 countersheets (2 of 1/2″ counters; 3 of 5/8″ counters) inexplicably depicting the alleged “summer 1942” Soviet OB in an alternative dark red color scheme. Nationality Set 8: Japanese Army Mustard. Forthcoming. 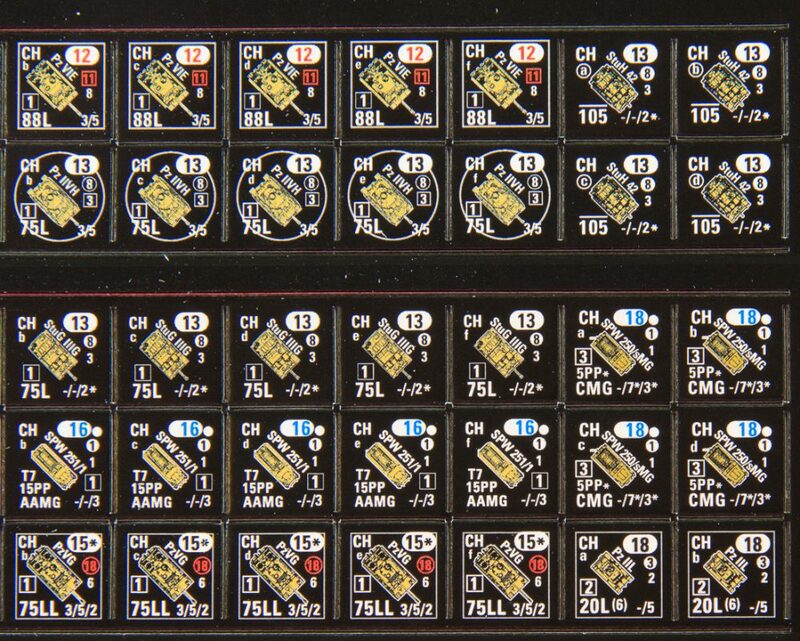 This counter set allegedly contains 5 countersheets (2 of 1/2″ counters; 3 of 5/8″ counters) depicting the Japanese OB in an alternative color scheme that strongly resembles the color of official Soviet counters in ASL. Nationality Set 9: French Army 1940. Forthcoming. Nationality Set 10: Partisans 1941-1944. Forthcoming. This counter set will allegedly have counters for Soviet (only) partisans.